Helping wineries take control of their Label Production. 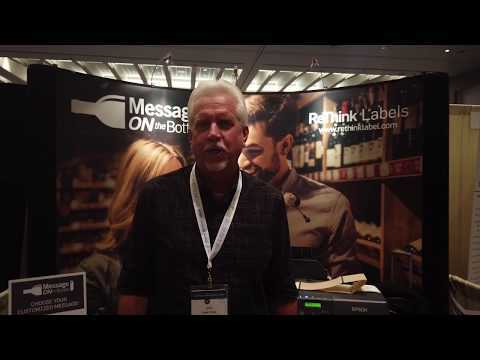 Our mission at ReThink Labels is to help wineries change the way they print labels. With 25 years of experience in the label printing industry, we are leaders as an on-demand label printing solution provider. Surveys show that companies are facing significant increases in labeling challenges. The increase in consumer demands and government regulations are making traditional ways of printing labels limiting and outdated. Schedule a Demo to Learn more about printing labels on-demand. 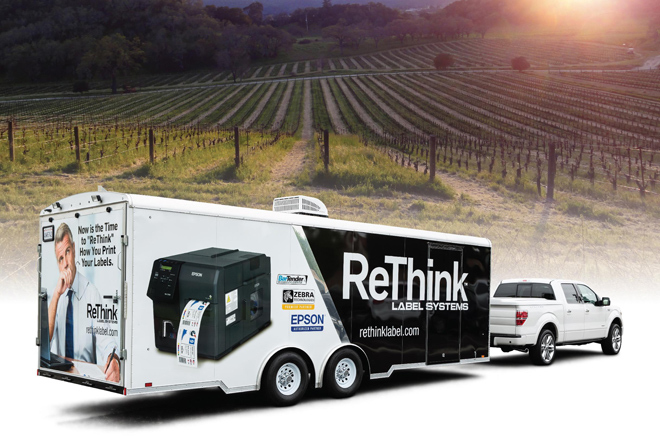 To help wineries see this breakthrough in action, ReThink has built a Mobile Showroom. Ask us for a visit so you experience, first-hand, this amazing system and the quality of labels it produces. Simply request a roadshow and we will bring the demo to you -- schedule online. As the only Label System Provider on the West Coast with long standing Premier Partnerships with both Epson and Zebra, we are the only company that can provide you with the latest in On Demand Label Printing Solutions and Exclusive Service Agreements with Certified Technicians. Hardware – We’ve partnered with Epson to provide the newest technologies and highest quality products available for label printing production. Labels– With over 100,000 label variations available, we can create almost any combination of face stock and adhesives to fit your application needs. Software– Use our experience to select variable information, barcoding and label design software for a stand-alone barcode printing project, or one that integrates with your enterprise system. Supplies– Rely on our expertise to choose the supplies that are the most cost effective and that perfectly match your label printing requirements. Service & Support: Reduce the cost of downtime with a ReThink Labels Service Agreement, which includes genuine printer parts and certified technicians along with loaner and Hot Swap Programs. Watch the video to see John print customized labels in a matter of seconds. Showcased at the Unified Wine & Grape Symposium January 30-31, this new solution from ReThink Labels gives wineries the best of both worlds for labeling—the ability to create outstanding award-winning labels for their brand, with the flexibility to personalize or customize each label with custom messaging. 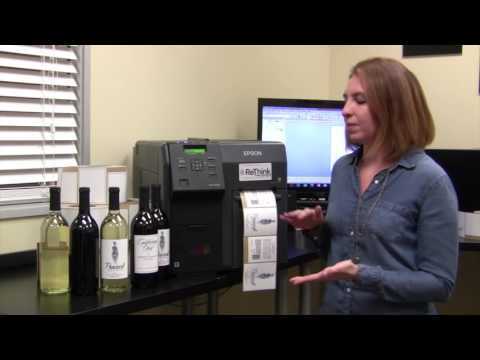 Breif overview of the benefits of the Epson C7500 for wineries. Description of materials offered for ink jet printing on demand for wineries. Testing label durability right after printing with the Epson C7500. 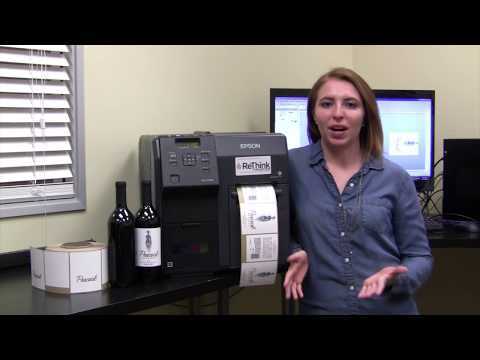 The Epson C7500 can print up to 300 cases of wine labels per hour! ReThink Labels has introduced a new solution that gives wineries the best of both worlds for labeling—the ability to create outstanding award-winning labels for their brand, with the flexibility to personalize or customize each label with custom messaging. Called “Message ON the Bottle™,” this breakthrough allows wineries to retain the integrity of their brands with embellishments like foil and embossing on labels with exact brand color matching, while offering the unique messaging that consumers want. It also provides a production advantage: vintners can make changes in wine content or other vintage details as needed on individual production run labels. Visit www.messageonthebottle.info for more details. ANAHEIM, Calif. – ReThink Labels has introduced a new solution that gives wineries the best of both worlds for labeling—the ability to create outstanding award-winning labels for their brand, with the flexibility to personalize or customize each label with custom messaging. Called “Message ON the Bottle™,” this breakthrough allows wineries to retain the integrity of their brands with embellishments like foil and embossing on labels with exact brand color matching, while offering the unique messaging that consumers want. It also provides a production advantage: vintners can make changes in wine content or other vintage details as needed on individual production run labels. Until now, wineries were faced with an “either/or” scenario, where they had to choose between pre-printing labels that they couldn’t customize, or personalizing labels that did not look as distinctive as professionally printed labels. Thanks to its partnership with Epson, ReThink Labels has devised a system that gives wineries the opportunity to have their labels both ways: custom-tailored to maintain brand integrity and personalized to meet customers’ unique preferences. “People are adding their own messages on bottles to make a wine even more special or meaningful for any occasion. We’re also seeing new creative marketing campaigns,” said Trail. The new solution is ideal for wine tasting rooms and wine clubs. From the production standpoint, wineries can streamline labeling and bottling operations. The system allows them to print all the variations of varietals, change alcohol content percentages for different vintages, create variable data with a numbering system for limited editions of wine, and generate export labels that vary by countries’ laws and regulations. And label production with this system is fast, printing enough labels for 200 cases of wine in 30 minutes. The system is easy to use. An individual can type in the personalized message using a mobile device, or a tablet, and that information will be transferred wirelessly to the system and generated on the label. For more information, visit www.messageonthebottle.info or visit us at booth 2604 at the Unified Wine & Grape Symposium Trade Show January 30-31. 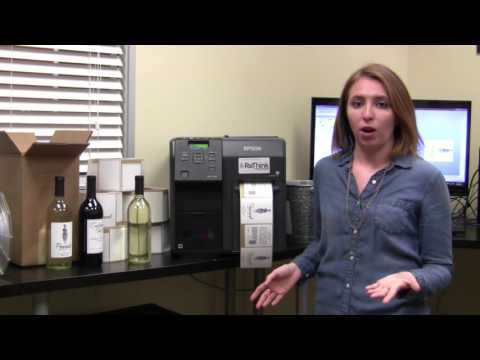 Watch this quick Wine Hooligans story to see why another winemaker couldn’t believe what she heard about his labeling--and how else the ReThink Labels Solution adds value to their operation. Give us a call at 844–556-7300 to explore how ReThinking your labels can help your winery. Wine Hooligans’ goal is to create and reinvent artisan wine labels with identity, purpose and authenticity. The team of winemakers is creating five brands, each reflecting their unique styles and a specific California region—from Sonoma to the Central Coast. ReThink Labels is an industry leader with 25 years of experience as a provider of both thermal transfer and inkjet label printers and supplies. Recent breakthroughs with Epson’s full color inkjet printing technology brings new benefits to the marketplace. 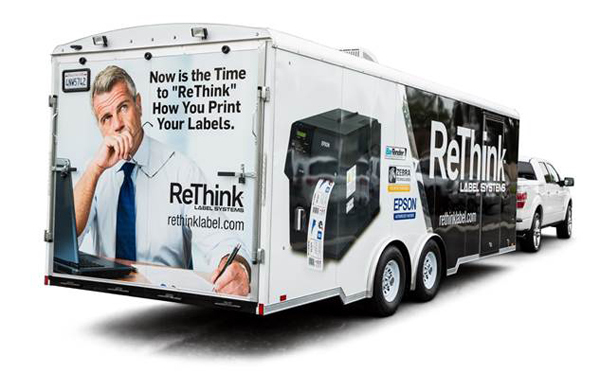 ReThink can help you take advantage of solutions like: Eliminating the need for pre-printed labels by printing professional quality labels in-house and printing your product labels yourself, cost effectively. Wine Label Roadshow Comes to You! Recently we made a big splash introducing a new wine label printing breakthrough from Epson. To help wineries see this breakthrough in action, ReThink has built a mobile showroom that will come to your winery to give you an exclusive demo. Our roadshow will come right to your parking lot and in just 30 minutes you can see this completely new approach to wine labeling in action! We will even print your label during the demo. Learn how you can take control of your label production by printing labels yourself at your winery. Learn ways to better manage and streamline export and back labels. 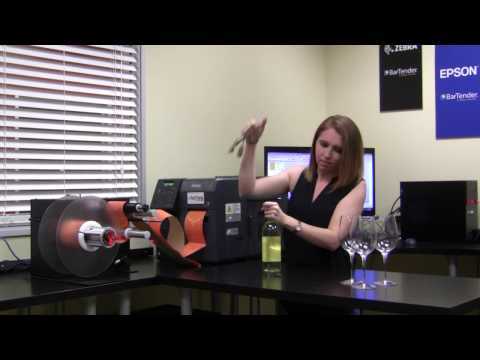 Stay current on new ways that wineries are printing labels to increase flexibility & control. Get advice from label printing experts with 25 years of experience in the industry. Hurry and reserve your exclusive demonstration – Spaces are filling fast! Contact Andrea Araiza at 714-363-4188 to schedule.
" At Mutt Lynch Winery, we’re dog lovers who love nothing more than to customize a label with the picture of someone’s special pet. We also do private labels for charitable causes, like animal welfare nonprofits. Thanks to the Epson color printer, we’re getting “heads to tails” better quality, and that’s translating into better sales. We’ve sold 4x as many cases with these new labels—the quality is that good.\r\nFor us, the ReThink Roadshow was key in placing our order. When we saw the printer in action--the ease and the quality--it was a real eye-opener, and our decision was made.\r\n "
" Our wine distribution company offers private labeling for our customers. Thanks to our longstanding connection to ReThink Labels, we were introduced to the Epson system. Now, we’re printing much higher quality labels on a roll, and applying them faster on larger orders. With our previous print-on-demand system, we had to apply one label at a time. We’re really pleased, too, that our customers are noticing how much better the quality is with these private labels, compared to what we produced before. Another way we’re using this printer is for export back labels. These labels usually have information that changes with each order, and we print them in small batches. To avoid the costs of minimum orders and decrease loss from labels that are no longer useful, we will now print many of our export back labels with the Epson—which allows us to finish in a day, and at much lower cost per label. "